Just back from the Writer's Lab, Skyros. The group arrived on 15th August, which is a big holiday in Greece, one which celebrates the ascent of the Holy Virgin into heaven. A very important event in the Greek orthodox calendar. We arrived to a very lively island, festivities in full flow - and 42 degrees heat. 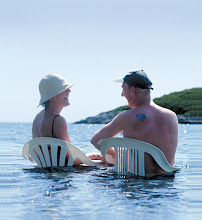 Funny thing, the weather and Greece and the British. We spent the first week discussing the extreme heat - and the second week discussing the high winds. If it had been perfectly still and evenly warm throughout - I'm sure we would have discussed that too. 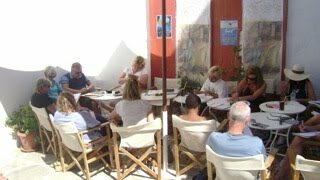 For the two weeks at the end of August, the Skyros Centre was turned into an exclusive Writer's Lab. Seventeen writers and me, just us. We ate drank, slept and talked writing all through the days and nights. 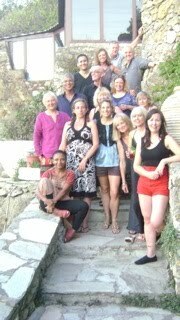 I can truly say that I have not had such a strong and talented group, either at Skyros or anywhere else. Half the group were easily well on their way to publication. In the first week, I taught the craft of fiction; we talked about how to make stories work on the page, how to make credible characters and how to make the world of the novel live. I had my students, walking the streets touching, smelling, listening to and tasting parts of the town they had never thought to taste. Week Two I steered the group into the broad umbrella that is 'life writing'. This is slightly edgier writing and it worked well that this was left for the second half of the holiday, when the group had bonded, gelled and relaxed - and trusted each other to share their life stories. On the final night there was a soiree type salon and the students sang songs and read their work. I have heard from several of the group since leaving Skyros, some of who are now applying to do an MA, others looking to form a small writing group in London. It was a holistic holiday - yoga, massage, Vasso's Kitchen, writing, writing writing, which is the right kind of work and quite a bit else thrown in. Wonderful chemistry. Thank you Skyros for inviting me again. I learnt a new word: idiotica, which is Greek for wanting to be alone. Monique Roffey ran her writing course at the Skyros Writers' Lab in Greece, named by The Guardian as No 1 of the World's 5 Best Writing Holidays. Monique's latest novel is The White Woman on the Green Bicycle. She is an ex Arvon Centre Director and Royal Literary Fund Fellow. She teaches Creative Writing for English PEN, Arvon and is a guest tutor on the Goldsmiths MA in Creative Writing. Monique has just been short-listed for the prestigious Orange Prize for Fiction award that is awarded to a female author of any nationality for the best original full-length novel written in English, and published in the United Kingdom in the preceding year. The Orange Prize forms part of the "trinity" of UK literary prizes, along with the Man Booker Prize and the Costa Book Awards. Skyros Holidays has built up a fine reputation for providing the very best, most sought after, holistic holidays over the past thirty years. These are truly unique holidays where people are simply encouraged to relax, be themselves, learn something new and make lasting friendships in the process.